Shares in Japanese infrastructure giants Hitachi and Mitsubishi Heavy have soared after they said they would merge their thermal power businesses. Hitachi rose 2.8% in Tokyo trade, Mitsubishi added 3%. On Thursday the companies announced a joint venture to make gas turbines, boilers and fuel cells. The move is aimed at competing with General Electric and Siemens as demand for electricity-generating equipment grows in Asia. "There are many Japanese companies today that are battling each other domestically and then again with foreign competitors," said the chief executive of Mitsubishi Heavy, Hideaki Omiya. "Instead of wasting our energy doing that, we should be banding together to become even bigger to take on our foreign rivals." 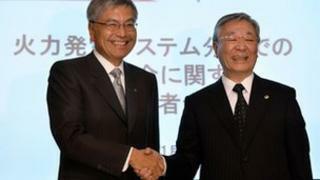 Mitsubishi will own 65% of the venture and Hitachi the rest, the companies said in a statement. Operations will begin in 2014. Domestically, the demand for fossil fuel facilities has spiked because of the fall in popularity of nuclear power. After the tsunami and earthquake in March 2011 sparked a nuclear scare, Japanese utilities have taken all nuclear plants offline leading to an energy shortfall. Foreign companies have now been allowed in to bid for gas turbine projects. In September, General Electric and Toshiba beat Mitsubishi to win a contract to expand Chubu Electric Power Company's gas turbine combined cycle plant.